From the Black Power Salute to Kozakiewicz’s Gesture, the Olympics have long served as a platform for political demonstrations, writes Brian Pellot. 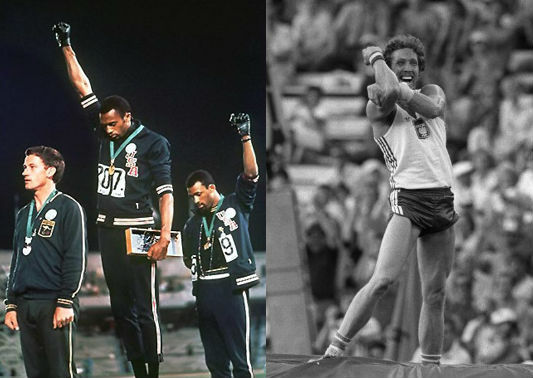 Left: Gold Medallist Tommie Smith, (center) and Bronze medallist John Carlos (right) showing the raised fist on the podium after the 200m in the 1968 Summer Olympics, AP Photographer. Right: Wladyslaw Kozakiewicz makes a gesture to the crowd after setting a new world record in the Olympic pole vault final 30 July 1980 in Moscow and winning the gold medal, STAFF/AFP/Getty Images. The modern Olympics have long served as staging grounds for political protest. Gestures and demonstrations at the Games continue to spark free speech debates around the world. As the torch rapidly approaches London, here’s a look at five Olympic moments that raise interesting – and sometimes amusing – issues around freedom of expression. Polish pole vaulter Wladyslaw Kozakiewicz slapped his bicep and thrust his right fist into the air after winning gold at the 1980 Moscow Olympics. In an already tense political climate, with some Western countries boycotting the games, the predominantly Soviet audience interpreted the gesture as an unambiguous middle finger to their host nation. When the Soviet ambassador to Poland later suggested Kozakiewicz be stripped of his medal, Polish government officials attributed the athlete’s gesture to involuntary muscle spasm. In the midst of America’s civil rights movement, US sprinters Tommie Smith and John Carlos raised their black-gloved fists to protest racial discrimination and human rights violations. The silent gesture was met with a roar of boos, overshadowing the American national anthem played to recognise the pair’s gold and bronze finishes in the 200 metres race. The International Olympic Committee ordered that Smith and Carlos be suspended from their team and expelled from the Olympic Village for violating the Games’ apolitical mission. The sprinters faced death threats on their return to America, but are now honoured for their efforts to advance racial equality. British decathlete Daley Thompson’s controversial antics reached their apex when he took a victory lap after his 1984 gold medal performance in a shirt bearing the words “Is the World’s 2nd Greatest Athlete Gay?” Making an obvious reference to Carl Lewis, who won four golds the same year, Thompson fanned the speculative flames around Lewis’ sexual orientation. Many spectators questioned whether such an ostentatious intrusion into another athlete’s private life was suitable for the Olympics stage. As The Troubles escalated in Northern Ireland, Belfast native Mary Peters won gold in the pentathlon for Britain. Despite numerous death threats, Peters returned victorious to Belfast and paraded through the city streets. Her refusal to accept violent intimidation championed free expression the same year Palestinian terrorists hijacked the Games and killed 11 Israeli athletes and coaches. Olympic organisers have offered free condoms in the Olympic Village since 1992. When the Games came to the conservative Mormon heartland of Salt Lake City, this standard practice became a source of controversy. Religious pro-life groups protested the planned distribution of 250,000 free condoms, and the official number was scaled down to 100,000. This is one of a number of features on the Olympics and freedom of expression on freespeechdebate.com. To learn more about how free speech debates have shaped the Olympics, visit Free Word Centre’s Politics and Olympics Exhibition or pick up Index on Censorship’s latest issue Sport on Trial.